We carry every U.S. Flag from 1778's 13 Stars to 1959's 49 Stars. By law, a star is added to the U.S. Flag on the 4th of July following the admission of a State(s) to the Union. It is important to note that no U.S. Flag ever becomes obsolete. These are still legal flags and may be flown at any time. 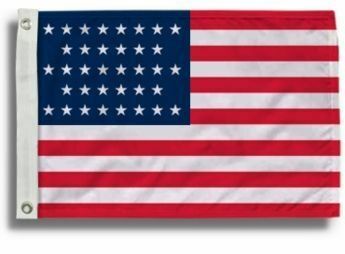 These flags are made-to-order and usually ship in 5-7 business days.